Chicken with gravy is a favorite meal in my household. It’s also fairly easy to prepare, which makes it the perfect recipe with which to start this series (in case you missed the announcement earlier today, I’ll be posting recipes here from my upcoming book, To Serve Cats: Yes, It’s a Cookbook, But It’s Not Like the One in That Twilight Zone Episode and challenging my readers to try them). Let’s start with the basics. The first step to attempting this — or any — recipe is to prepare your mise en place, or workspace. 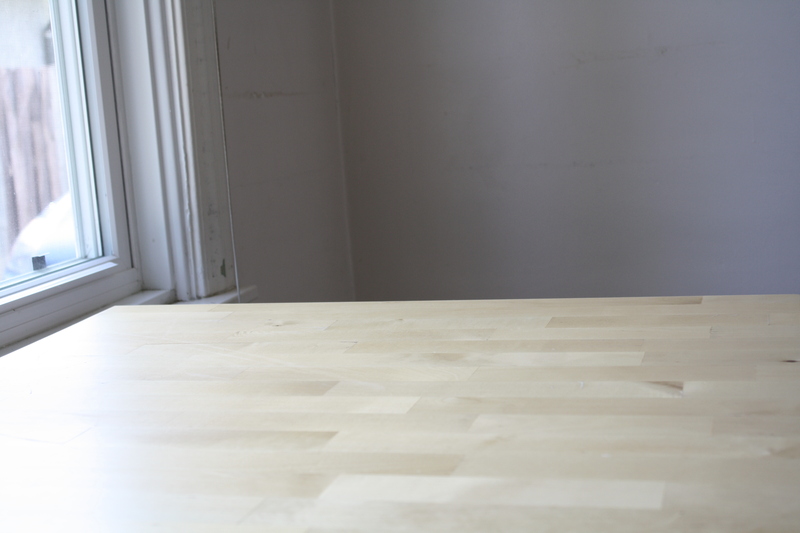 It’s really quite simple: find a suitable work surface, clear away any excess clutter, and gather the ingredients and tools you’ll need. The next three pictures were taken as I prepared my mise en place for this recipe. First, find a suitable workspace. Choose a surface at a comfortable height, with adequate space and lighting. Next, clear away any excess clutter. Finally, gather the ingredients and tools you’ll need for your recipe. 1 5.5 oz (156 g) can high-quality chicken-flavored cat food. 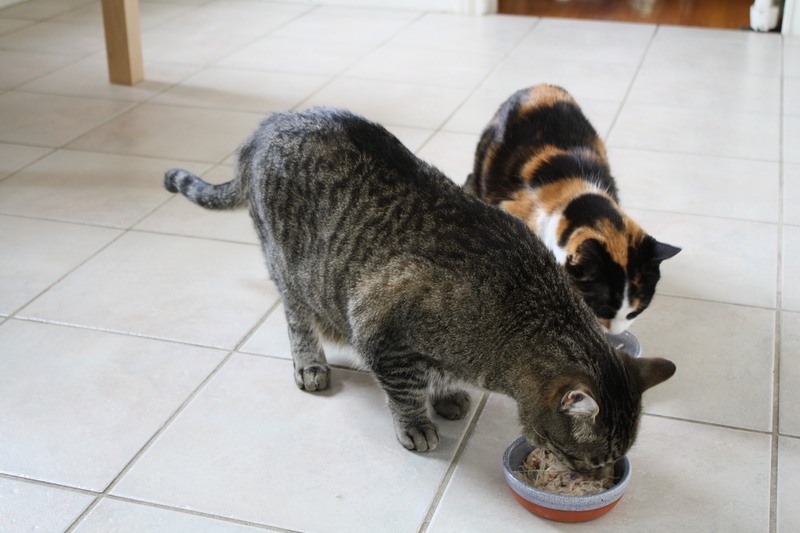 Note: you can substitute low-quality cat food, but the result won’t be as good. 1. Open the can of cat food (use the optional can opener if the can requires it). 2. Using the fork, transfer half of the food from the can into one of the dishes. 3. 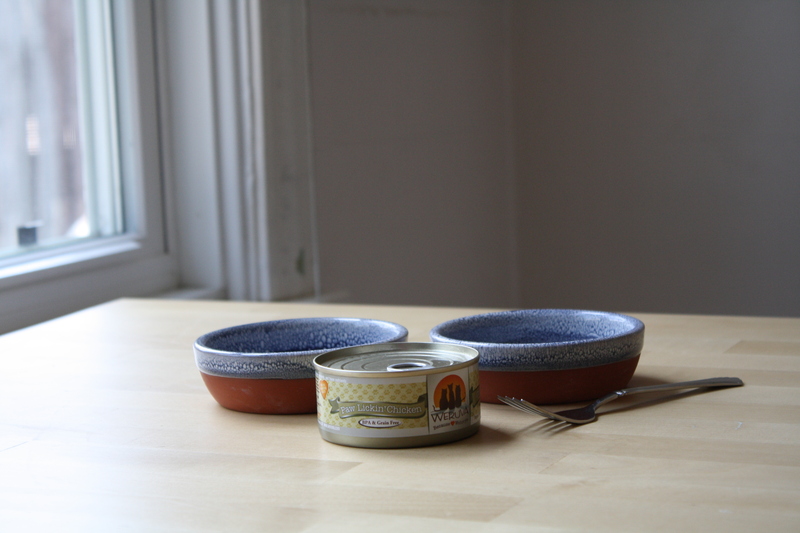 Using the fork, transfer the remaining food from the can into the other dish. The verdict: both Holly and Thunder rated this recipe as “worth waking a human at 5am for”. When selecting a commercial cat food, be sure to read the label carefully. You can tell a lot about a cat food by reading the label. 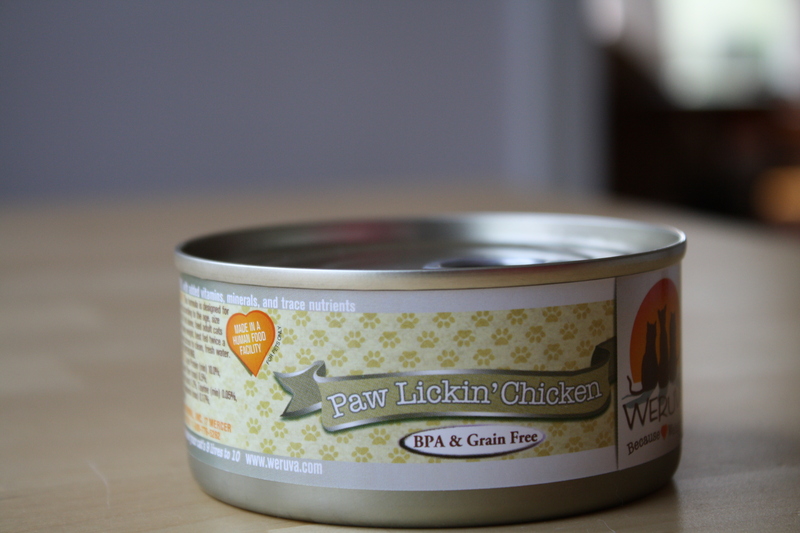 For example, the label pictured here tells us that the flavor name is Paw Lickin’ Chicken, which is a pretty clear indication that it’s made by a company that cares more about the quality of its food than about marketing. If they’d gone through a formal marketing process with meetings and focus groups, someone would have pointed out that Paw Lickin’ Chicken is a horrible name for a cat food flavor: cats typically don’t eat with their paws, so their paw-licking behavior isn’t influenced by how much they enjoy their meals. Because the flavor name is so bad, we can conclude that the company has its priorities straight and that the food is probably pretty good. Wait — does that mean it’s a good flavor name? I may need to rethink this. In the meantime, read the label. I’m sure there are ingredient lists and stuff on the other side. And in case you missed the earlier announcement — you’re invited to join the Unlikely Explanations Recipe-a-Week Challenge. Just a) obtain a cat, b) prepare this recipe, c) feed it to your cat, and d) add a comment here describing your experiences and your cat’s reaction. Update: the next recipe in this series is now available. Thanks. The hardest part about writing this was trying to select the most photogenic carrots and celery at the supermarket. This is an interesting recipe. Could I substitute dog food? I don’t know how well cat food would go over at my house. That will be covered in my second cookbook, I Guess Dogs Have to Eat Too. What, no desert? Do they have cake in a can? I am a very good can opener (no jokes, please; I mean an opener of cans, not an actual can opener), and as such prefer all my recipes to be canned. Plus I think the tinny taste imparted by the cans add an element of elegance to any meal. It’s the 21st century; of course there’s cake in a can. My cookbook actually has an entire chapter devoted to my cats’ favorite dessert: crab cakes. omg you had me fooled!! LOL! I hate you a little bit for thinking of this before I did. I’m really good at giving compliments. I hate you a little for having such awesome complimenting skills. Laura, you make it sound so easy, I want to go and get myself a cat to try it out… and you chose great photogenic carrots! Thanks — I actually bought the carrots that had the nicest looking greens, but then wound up cutting them off for the picture anyway. Are you sure you’re not Jessica Simpson in disguise? 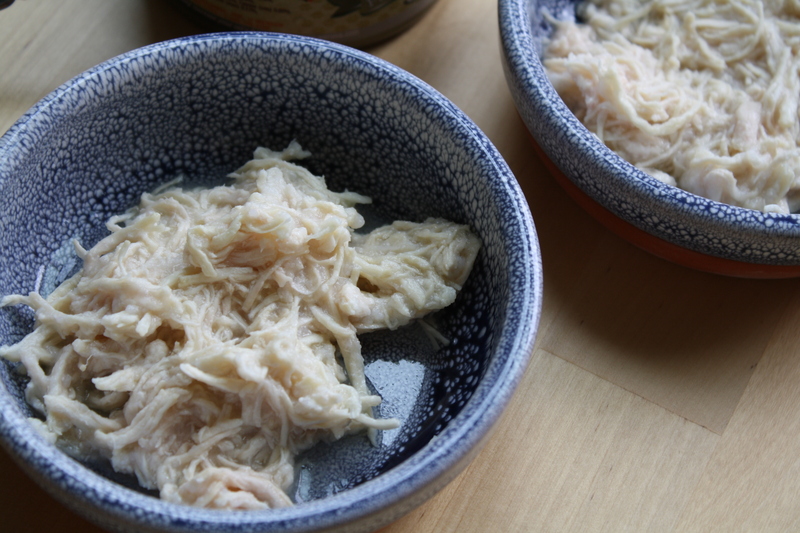 Tuna jingle -> things cats might sing about -> this. 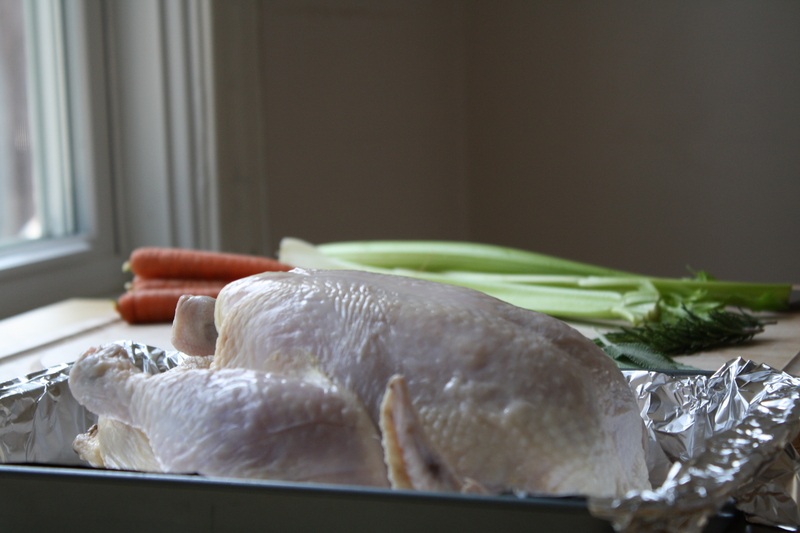 OK, the sequence of photos you used for preparing your mise en place made me laugh out loud. Simple visual humour? Yes. Awesome? Yes! I think there’s definitely a market for recipes as simple as this one too. I tried it and it only took about 40 seconds to prepare. Even my ‘microwave tomato soup’ recipe can’t achieve those levels of laziness in preparation! I’ve actually done extensive research into microwave tomato soup, and it turns out that the trick is to take it out of the can first. I learned that lesson the hard way. You’re lucky your cats don’t like beef, because if you have to buy an entire frozen cow as a comedic prop then it gets to be less productive. Actually, the first draft did feature beef, but my kitchen table collapsed under the cow’s weight. You had me going there for a moment, Laura! Above comment was from me! The weirdest part about writing this was going to the supermarket and looking for the most photogenic carrots I could find. Um… Yum? Very funny! Passing this on to my neighbor’s cat. I hope your neighbor’s cat considers leaving a review on Amazon. Thanks for bringing your “April Fool” to the party! Have fun clicking on links and “mingling” with the guests! I actually made a mockup of a book cover, and on the day I posted this, I added a “pre-order the cookbook” widget to the blog. That is good! You are thorough! Hahaha!